Custom Home on 1.7 acres overlooking the 2nd hole at the Woodlands Country Club. Vaulted ceilings, skylit, open floor plan with master suite and private guest suites. His and her offices. Open concept living room offers 2 sided gas fireplace. 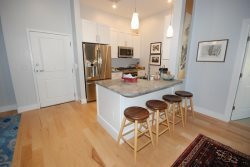 Kitchen offers granite counters and lots of workspace and storage. Multiple decks allow you to enjoy the view. Home is set back nicely from the road offering privacy. 3 car garage.